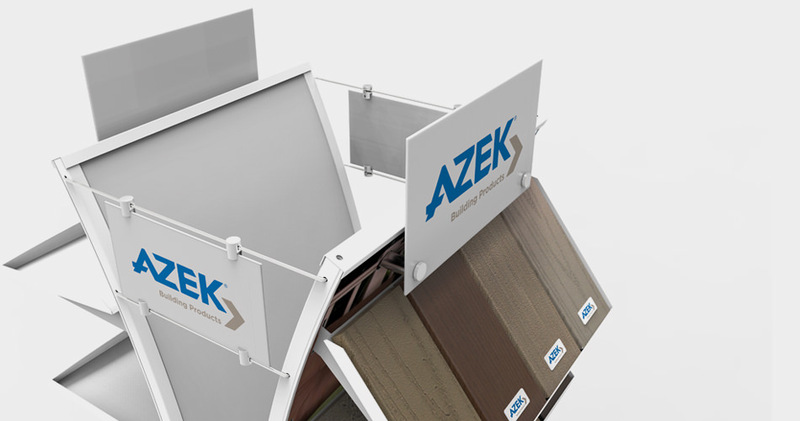 The AZEK product display is a versatile unit designed to merchandise the complete AZEK line of products from decking and pavers to illuminated railings all in a singular small footprint. 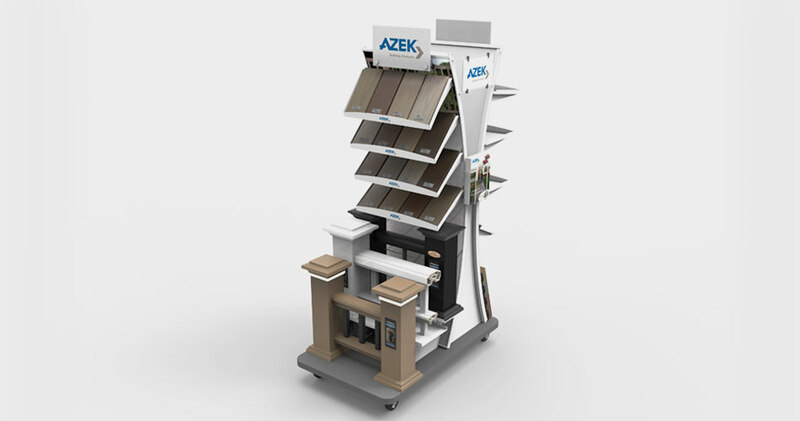 AZEK, a division of CPG Building Products, was in need of a new display that could showcase a variety of products, including decking, railings and pavers. 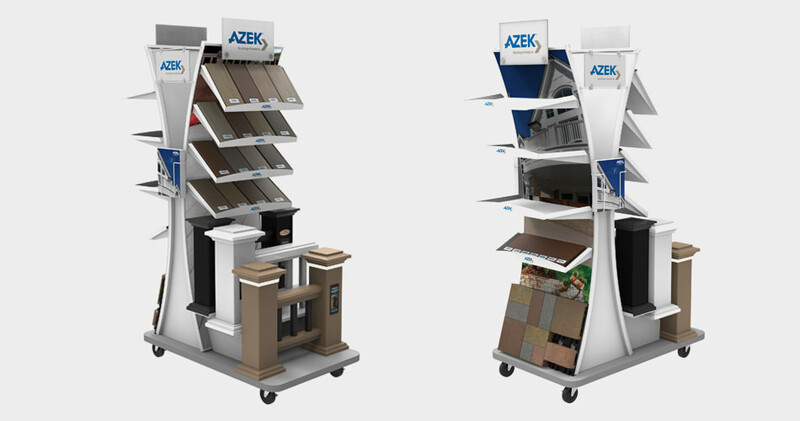 The unit needed to be robust, able to support a substantial weight load, while uniquely shaped to differentiate it in the crowded building products retail environment. Envisioning an open design, Bench Dogs got to work – producing nearly a dozen initial design concepts. Each design was uniquely suited to stand out amongst competing displays in the building supply environment. The client selected a metal structure with curved side panels that captured one of the key design goals of being an open design. The design utilized value-added engineering that allowed all products to be displayed while keeping to a minimal footprint. Bench Dogs’ engineering team provided all necessary structural load testing to ensure the display’s structural strength, while the use of a proven global supply chain assured that the unit could be produced at an optimal cost. Bench Dogs’ product designers developed further modifications, including a custom cable photo frame which was used to showcase branded collateral along the sides of the display. Bench Dogs produced over 1,800 units which were distributed nationwide. The team managed the complete fulfillment of the project, guaranteeing efficient delivery to each retail location. 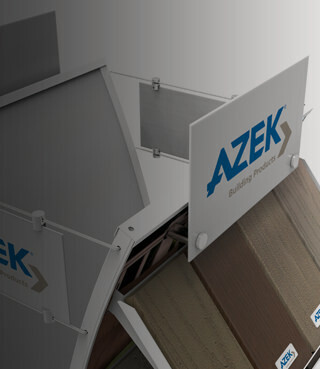 The success of the program helped to establish our relationship with AZEK, as Bench Dogs became a trusted partner for future merchandising programs.